Why Does an Animal Shelter Care About Bullying? Fact: Hurt people hurt animals and people. Children who abuse animals often have experienced abuse or neglect. When children abuse animals it is likely a precursor to future violence. There is a direct link between school-age students who practice bullying and adult perpetrators of domestic violence. Most teen school shooters have a history of abusing animals. Many people incarcerated for violent offenses to people report abusing animals as part of their first experiences with violence. The majority of families experiencing domestic violence report their family pet was also abused by the perpetrator of violence. Virtually all serial killers report tormenting and abusing animals early in life. People, abused by people, often abuse animals. People who abuse animals often also abuse people. And so the cycle goes. 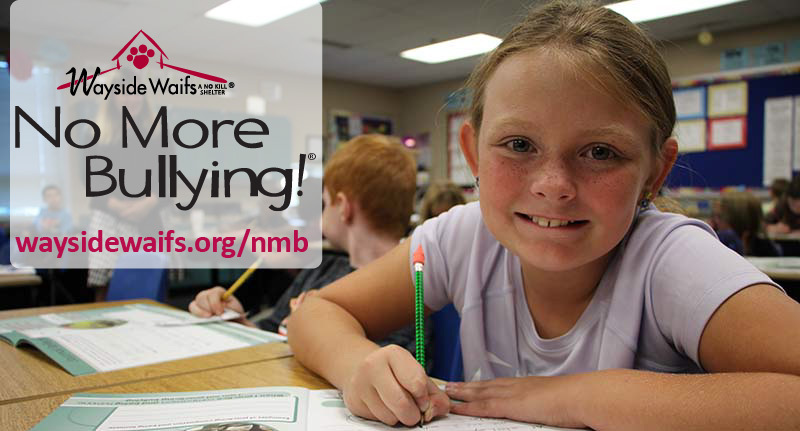 If you have any questions about the No More Bullying!® Curriculum, please contact Ashley Stanley, Humane Education Manager. *The above information was collected from numerous published sources, primarily the National Link Coalition, the Humane Society of the United States, the American Society for the Prevention of Cruelty to Animals (ASPCA), the American Humane Association and the United States Department of Justice. 2012-2015 Copyright Wayside Waifs. All rights reserved. WAYSIDE WAIFS and the Wayside Waifs logo are registered trademarks of Wayside Waifs, Inc.